Making a tasty gluten-free pie crust shell is actually not all that difficult, as long as you have a good gluten-free flour on hand. This recipe uses just three simple ingredients—shortening or butter, gluten-free flour, and cold water—for a blue-ribbon-worthy pie crust shell. When it comes to gluten-free baking, we've had good luck with Bob's Red Mill brand gluten-free all-purpose baking flour. As well as their almond flour. A quick note about this recipe: You'll see that it doesn't actually call for any sugar, so this is a good gluten-free pie crust recipe to use with either sweet or savory pies. If you need this recipe to be vegan as well as gluten-free, just be sure to use shortening instead of butter. 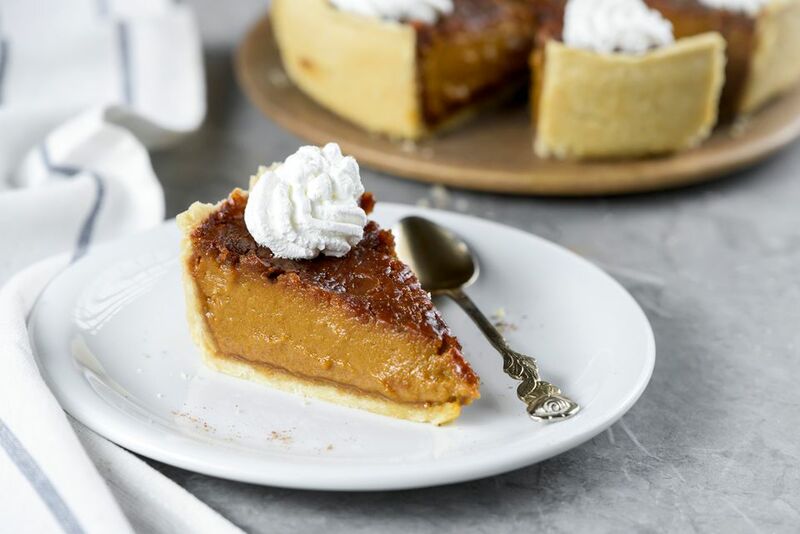 Butter will make your gluten-free pie crust a bit flakier and add flavor, but as long as your pie filling is absolutely delicious, it won't matter too much either way, right? No rolling is involved. This is a press the crust in the pan recipe that is ideal for those who claim subpar rolling-pin skills. Heat the oven to 400 F. Have an 8-inch pie pan at the ready. In a medium bowl, cut the shortening or butter into the rice flour or other gluten-free flour until crumbly. Add the cold water and then use your hands to work the dough until soft. The mixture will be crumbly at first, but will slowly come together as a dough. Do not overmix. Once your dough comes together, form it into a single ball. Next, place the dough in an 8-inch pie pan and press it into the bottom and sides. You can use the back of a spoon, a fork, or even your (clean) fingers for this. Once your pie crust is comfortably in the pie pan, take a fork and prick the bottom of the crust a few times. This allows steam to escape as needed and helps to ensure that your pie will bake evenly and smoothly. Place your prepared pie crust in the heated oven and bake for about 12 to 15 minutes, or until the edges of your pie crust are golden brown. Remove from the oven and allow to cool completely on a wire rack before filling with whatever you like. Note: If you choose to make an apple pie, pecan pie, custard pie, or other pie that requires the filling to be baked, omit pricking this crust before baking it, add the filling to the unbaked crust, and bake until the filling is of the right consistency.